Root Riot™ Organic Plant Starter Cubes are available in bags of 50 and 100 replacement cubes. 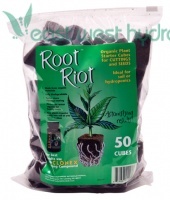 Root Riot™ Organic Plant Starter replacement cubes are pre-moistened so they are ready to use right out of the bag. Dimensions: 12.5in. × 8.5in. × 4in.